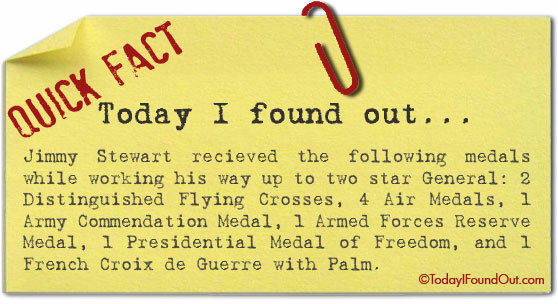 Jimmy Stewart recieved the following medals while working his way up to two star General: 2 Distinguished Flying Crosses, 4 Air Medals, 1 Army Commendation Medal, 1 Armed Forces Reserve Medal, 1 Presidential Medal of Freedom, 1 French Croix de Guerre with Palm. @knysna: “i before e except after c”: ancient, species, science, sufficient, seize, weird, eider, either, height, foreign, leisure, counterfeit, forfeit, neither, atheist, their, neigh, neighbor, sleigh, sleight, weigh, weight, height, eight, freight, inveigh, reign, foreign, sovereign, deign, feign, caffeine, casein, codeine, protein, being, seeing, etc. Good rule. 😉 In truth, it’s called a typo. They happen sometimes to the chagrin of grammar Nazis everywhere.